Ginger is a tropical plant that grows outdoors in areas with mild winters. If you live in colder climes, it is still possible to grow both edible and ornamental ginger in a planter outdoors as long as you bring it inside for winter. Ginger is propagated by its rhizomes. A rhizome is an underground stem, similar to a root or bulb, that multiplies each year as the plant grows. When propagating edible ginger, save a few pieces of the rhizome from the kitchen, and grow them into new plants. Dig around the ginger plant with a trowel to loosen the soil in late fall when the plant begins to yellow and enter dormancy. Rhizomes sit about 2 inches beneath the soil surface, so there is no need to dig deeply. Cut off a section of the rhizome, once it is uncovered, with a sharp knife. Remove a 3 to 6 inch piece that has at least two growing buds, which resemble small horn-like protrusions on the root. Prepare a well-drained garden bed in full sun for replanting by working a 2-inch layer of compost into the soil. For pot growing, fill the pot with a quality potting mix that is rich in organic matter. Plant the ginger rhizome 2 to 4 inches beneath the soil surface in either the bed or a pot. Water immediately after planting so the soil is slightly moist but not soggy. Water as needed to keep the soil moist throughout the spring and summer growing season. Lay a 1 inch layer of mulch around outdoor plants to keep the soil cool and to suppress weeds. Divide or harvest ginger rhizomes after the plant is at least two summers old. Harvesting earlier may stunt the plant's growth. The best time to harvest is after the foliage begins to die back in fall, but you can harvest the roots at any time with only minimal shock to established plants. 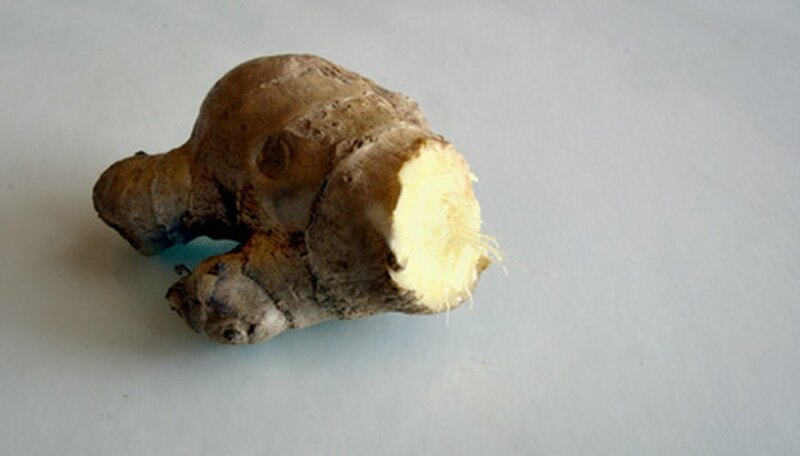 Use a clean knife to cut the ginger root, otherwise disease or rot may infect the piece, and it won't grow.